Staring Mr. Punch, Judy, the Baby, the Policeman, Joey the Clown, the Ghost and the Crocodile etc. Each show lasts for 30 minutes and includes a traditional striped booth & PA system. By and large for a full day affair artist alternate 30 minutes on, 30 minutes off for spells longer than an hour. Fees vary according to venue, date and time. Prices subject to VAT, availability, accommodation and transport costs where applicable. Prices include a million PL. Punch and Judy is a popular puppet show featuring Punch and his wife Judy. The performance consists of a sequence of short scenes, each depicting an interaction between two characters, most typically the anarchic Punch and one other character. 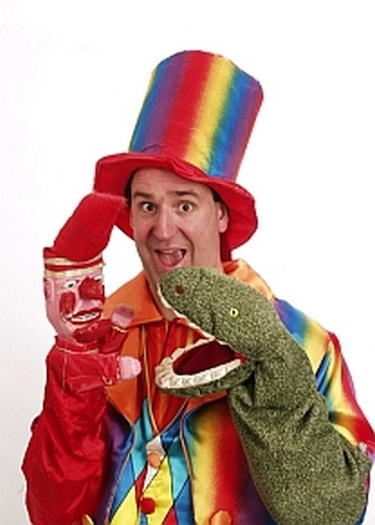 The show is traditionally performed by a single puppeteer, known as a Professor. The Punch and Judy show can trace its roots to the 16th century to the Italian commedia dell'arte. The figure of Punch derives from the stock character of Pulcinella, which was Anglicized to Punchinello. He is a manifestation of the Lord of Misrule and Trickster figures of deep-rooted mythologies. Punch's wife was originally 'Joan'. May 9, 1662 is traditionally reckoned by 'Professors' as Punch's UK birthday, for that was the first recorded date on which the figure who later became Mr. Punch was seen in Britain. The diarist Samuel Pepys observed a puppet show featuring an early version of the Punch character near St. Paul's Church in London's Covent Garden. It was performed by an Italian puppeteer, Pietro Gimonde operating as 'Signor Bologna'. Pepys described the event in his diary: '...an Italian puppet play, that is within the rails there, which is very pretty, the best that I ever saw, and great resort of gallants.' Pepys went back several more times and continued to be amused. The puppet he saw was a marionette, not a glove-puppet, and Gimonde did his show within a tent. In the British 'Punch and Judy' show Punch wears a jester's motley and is a hunchback whose hooked nose almost meets his curved jutting chin. He carries a stick, as large as himself, which he freely uses upon all the other characters in the show. He speaks in a distinctive squawking voice, produced by a contrivance known as a swazzle or swatchel which the Professor holds in his mouth, transmitting his gleeful cackle� 'That's the way to do it'. So important is Mr. Punch's signature sound that it is a matter of some controversy within Punch and Judy circles as to whether a 'non swazzled' show can be considered a true Punch and Judy Show. Many regional variants of Pulcinella were developed as the character spread across Europe. In Germany, Punch is called 'Kasperle' or Kaspar while Judy is 'Grete'. In the Netherlands it is Jan Klaassen (and Judy is Katrijn); in Denmark Mester Jackel; in Russia Petrushka; in Romania Vasilache; and in France Polichinelle. In the late 18th and early 19th Century the familiar Punch and Judy hand puppet show that existed in Britain was performed in an easily-transportable booth (known as a fit-up). The tale of Punch and Judy varies from puppeteer to puppeteer and has changed over time. It typically involves Punch behaving outrageously, struggling with his wife Judy and the Baby, and then triumphing in a series of encounters with the forces of law and order (and often the supernatural). The classic ending of the show has him dispatching the Devil himself, exclaiming 'Huzzah huzzah, I've killed the Devil!'. All is performed in the spirit of outrageous comedy and is intended to provoke shocked laughter. Whilst the Victorian version of the show drew on the morality of its day, the 20th and 21st Century versions of the tale have evolved into something more akin to a primitive version of The Simpsons � in which a bizarre family is used as vehicle for grotesque visual comedy and a sideways look at contemporary society. The stereotypical view of Punch casts him as a deformed, child-murdering, wife-beating psychopath who commits appalling acts of violence and cruelty upon all those around him and escapes scot-free � this is greatly enjoyed by small children. Terry Pratchett draws attention to this apparent paradox in his short story Theatre of Cruelty, the last line of which is 'That's not the way to do it.' In actual fact, Punch has long since reverted to his origins as a clown figure whose acts of violence are in the same tradition as those to be seen in all classic cartoons. The very stick he uses is a slapstick: the knockabout device which gave its name to a whole genre of broad physical comedy. In 1828, the critic John Payne Collier published a Punch and Judy script under the title The Tragical Comedy or Comical Tragedy of Punch and Judy. The script was illustrated by the well-known caricaturist George Cruikshank. Collier said his script was based on the version performed by the 'professor' Giovanni Piccini in the early 19th century. The Collier/Cruickshank Punch has been republished in facsimile several times and is now available on the web in PDF form (see External Links). As Collier later went on to have a career as a literary forger, it throws some doubt on the authenticity of the script which is rather literary in style and may well have been tidied up from the rough and tumble street theatre original. Punch is primarily an oral tradition, handed down (or copied) from live performances more than from scripts. It is thus constantly in development from many participants - exactly as Wikipedia functions. A transcript of a typical Punch and Judy show in London of the 1840s can be found in Henry Mayhew's London Labour and the London Poor.